Experience the vibrant South Yarra lifestyle right at your very door step in our brand new one bedroom apartments. 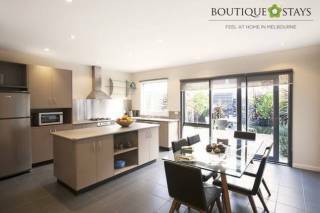 Located just off Toorak Road near the corner of Chapel Street, these stylishly furnished one bedroom apartments are your home away from home. Every apartment is fully self contained and offer every convenience you need. 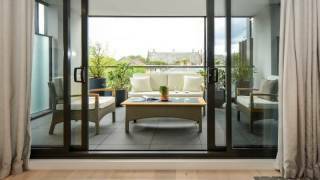 Experience the vibrant South Yarra lifestyle right at your very door step in our brand new two bedroom apartments. 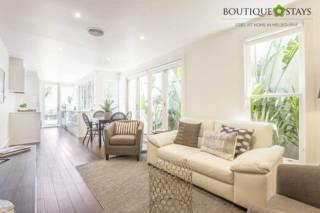 Located just off Toorak Road near the corner of Chapel Street, these stylishly furnished two bedroom apartments are your home away from home. Every apartment is fully self contained and offer every convenience you need. 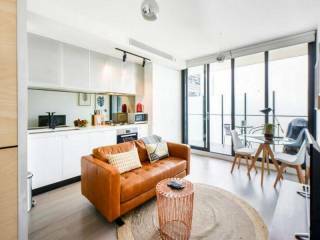 Experience the vibrant South Yarra lifestyle right at your very door step in our brand new three bedroom apartments. Located just off Toorak Road near the corner of Chapel Street, these stylishly furnished three bedroom apartments are your home away from home. Every apartment is fully self contained and offer every convenience you need. All apartments have a living area. There is also a kitchen fitted with a dishwasher, oven and microwave, as well as a coffee machine. There is a private bathroom with free toiletries in every apartment. Payment Policy - Full payment of the accommodation is required when booking. District South Yarra accepts the following credit cards - Mastercard, Visa, Amex. PEAK SEASONS - Victorian School Holidays, Long Weekends, Easter, Major Events(Australian Open Tennis, Australian Formula 1 Grand Prix, AFL Grand Final Weekend, New Years, Comedy Festival, Spring Racing Carnival and Christmas Holidays(24/12 – 31/1) In the event of your plans being changed, more than 60 days notice will receive a full credit, less a service charge of $50. If less than 60 days notice of cancellation is received your full deposit is forfeited unless the room can be rebooked, in this instance a partial refund may be available. LOW SEASON - In the event of your plans being changed, more than 48 hours notice will receive a full credit, less a service charge of $50. If less than 48 hours notice of cancellation is received your full deposit is forfeited. PROMOTIONAL/SPECIAL DEALS (Including but not limited to: Travel Zoo/Our Deal/Groupon/Scoopon/Luxury Escapes/Coxy's/Stay Pay Deals) No Cancellations or Refunds, Dates may be changed within validity period subject to availability.